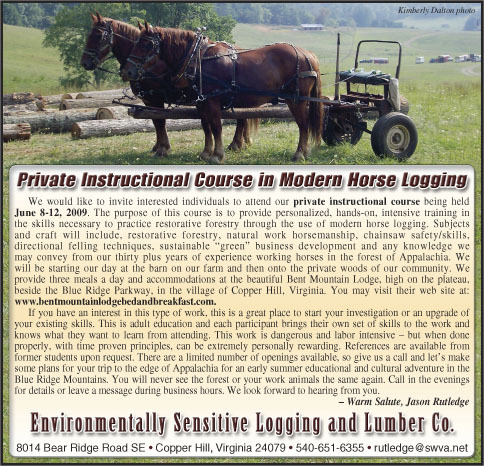 Big J’s been out in the Virginia woods for some real-world logging training with the rest of the working crew this month, along with Jason’s young gelding Chain; two beginners learning from the best, both men and experienced workhorses. He’s posted photos on his FB page, the first of many, I hope. J turned 10 on Sunday. She’s in foal to Rudy, Ridgewind Farm’s standing stud; her third pregnancy that I know of. I bought her and her daughter from a guy in Michigan two January’s ago and shipped them to Jason’s farm for training and, it was hoped, to be subsequently used by a couple of apprentices as a starter team. They were two big, beautiful Suffolk mares completely herd-bound to each other, hardly even green-broke, and sorely in need of patient, constant handling to develop ground manners, as well as basic training as future workhorses. They got lots of both, but the pair of young horseloggers needed a team to start their business long before my two girls were ready to pull their share of the load, so the original plan changed. Then changed some more, last Fall, when we decided to split up the mother/daughter pair after realizing the 5-yr-old’s temperament – disruptive, flighty, nervous, and protective of her mother – would always prevent the two from becoming a well-mannered, quiet, dependable team. It’s a common problem with a pair of horses left to themselves as these two were, and the mother-daughter bond only makes it worse. 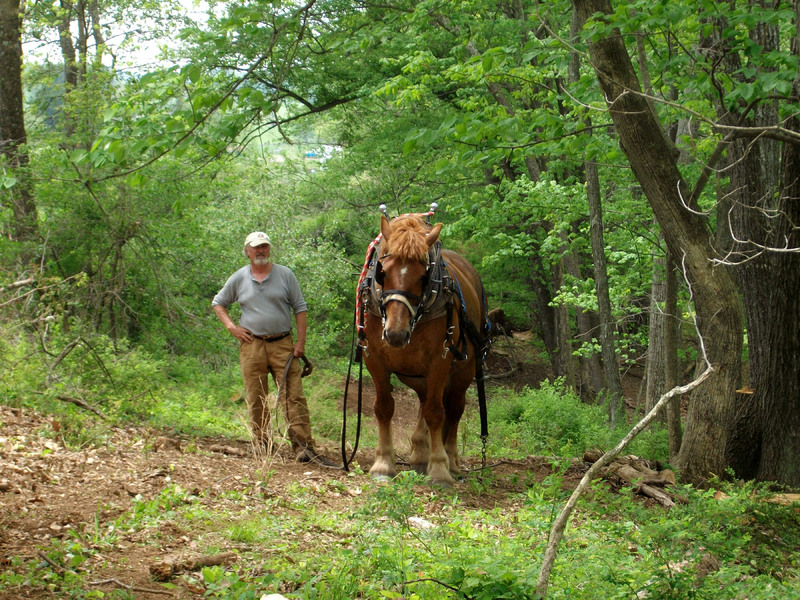 Another Biological Woodsman logging with Suffolks in southwestern Virginia took a liking to the bred young mare, an offer was made, and she has moved on to work for him and get him started as a Suffolk breeder. And I’ll be looking for a big, broke Suffolk gelding next summer to match up with Big J, who is becoming a wonderful workhorse under Jason’s tutelage. 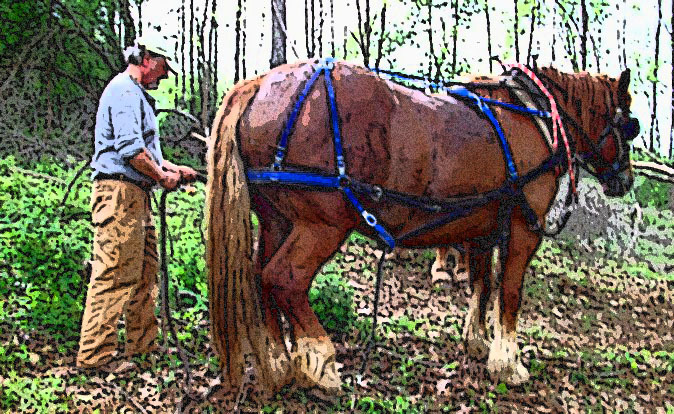 And so the months go by, and the work of training a horse to pull logs out of woods continues, as time and opportunity permits. I am so very grateful for all the effort and care and experience that is going into this endeavor. The hope is to have a well-trained team to begin with, when I move to the farm and start working in earnest on all that needs done. I have a neglected forest to manage, trees to cut for barn timbers, and pastures to mow and maintain, just for starters. My team of Suffolks will eventually do all the field and forest work, leaving the tractor to scoop manure and compost, lift heavy things, and provide power in the barnyard. We’ll start slow and small, of course, and having a team trained by Jason to train me as I learn will be worth its weight in gold. The dates of this course of instruction fall nicely into the leave period I’ll have after I return home from this Africa deployment. We’ll make a 10-day working visit to the Farm at the end of May, then I’ll put Derril on a plane back to San Diego and head on over to Virginia for some much-needed training for li’l ole’ Thistledog. Horses aren’t the only ones that need schooling. I’m really looking forward to this. Been getting myself ready physically, too – years ago I could have jumped right out there from a dead stop; nowadays my stamina and strength don’t stick around without being called upon, and I haven’t done much physical labor lately. So I’m back to weight training and hill-walking to bring myself up to speed. It’ll pay off for the whole trip, as my project list at the Farm will have me up at dawn and working until daylight fades; got culverts to clean out, road ditches to re-grade, and the corral fence panels to re-paint and move. Getting strong and tough now will save me a lot of pain later. One thing I won’t be surprised by is the heat. After a year in East Africa, my yardstick for comparing hot temperatures is mighty damned long.